We all understand that time and constant exposure to harsh environmental elements take a toll on our skin. Your once youthful glow has faded and has been replaced with dull, rough skin. No matter what home remedies you try, several days following the treatment, your skin returns to what it once was. 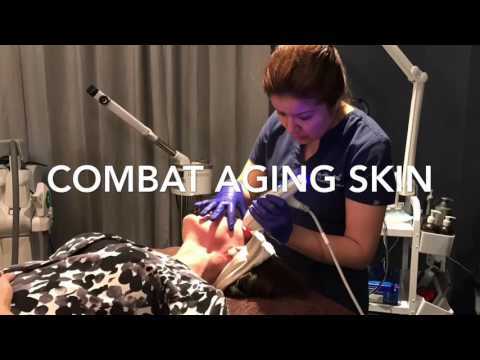 Facial lasers have been on the market for quite some time and is going through quite a boom in Northern Virginia. However, there is a multitude of them, and how is a patient to know which one is THE one for them? What if a patient desires to have the effects of a laser without having to hide out from their friends, neighbors, and coworkers due to the extreme after effects? What if patients desire a clear, smooth, radiant complexion that can be achieved during their lunch break? Clear + Brilliant may be the answer. Clear + Brilliant is a gentle laser that revitalizes the skin from the inside out and has been clinically proven to fight the effects of aging skin. It has also been termed “Baby Fraxel”, designed for those who are looking to refresh or maintain their skin. The laser works to generate heat, thereby stimulating collagen production. This process replaces the damaged skin with healthier, youthful tissue. "Love the clear and brilliant"
A consultation with a medical professional is required to determine if Clear + Brilliant is your preferred treatment. A topical numbing cream is to be applied 30 minutes prior to the start of our appointment to provide comfort for the duration of the treatment. With the numbing cream, there is little to no pain. Following the treatment, you will feel as though you are experiencing a light sunburn. The redness and slight swelling that follows the Clear + Brilliant procedures lasts no more than 24 hours. A majority of patients have noted that although they could feel the after-effects, most noticeably heated skin that feels like a light sunburn, it was not as physically noticeable as it would have been with more invasive laser treatments. You will also notice that your skin’s texture will feel a bit like sandpaper. After Clear + Brilliant treatments, following up with a daily moisturizer and sunscreen is vital. A few days following your Clear + Brilliant treatment, you will notice that your skin will lose that sandpapery texture to reveal skin smoother than you have ever had before. Your pores will also shrink so that they are barely noticeable and a radiant, youthful glow will replace your once dull complexion. Repeat Clear + Brilliant treatments are recommended once a month in order to achieve and maintain optimal results. Fitting these treatments into your schedule is as easy as it is to fit in an appointment for a haircut! If you already have a consistent skincare regimen, but want a boost in tis results, Clear + Brilliant may be right for you. This procedure is also recommended for younger patients as a preventative to aging. If you are a week out from an event and need a quick refresher, or you simply do not have the time to take off that more intense lasers would require, Clear + Brilliant is the answer.